Many thanks to The Herculodge and SWLing Post reader, Gary, for pointing out these two new portables from Etón Corp: the Etón Field and Etón Satellit. If you’re interested in the Satellit and would like to participate in open and active discussions, join this newly created Etón Satellit Yahoo Group. It’s interesting to note that FM RDS has become a feature on both the Field and Satellit and that they sport a unique orange LCD display. Update: Also note that Etón has introduced the Traveler III and the Mini 400 travel-sized shortwave portables. For those of you not familiar, Etón Corporation (based in Palo Alto, California) is also known as the Grundig brand throughout North America. Throughout the company’s history of designing and manufacturing shortwave radios, Etón has either branded their radios as “Grundig” or “Etón” (indeed, some models were branded with both, for example the Grundig G5 and Etón E5). I find the news of the Etón Field and Satellit very exciting as I feared the exit of the venerable Grundig G3 from the market might have also marked the departure of the company from the shortwave radio market altogether. Apparently not! This is quite important for the SWLing hobby (in North America, at least) as Etón and Grundig products are unquestionably some of the most accessible shortwave radios on the market. Nearly every corporate or franchise retail store of RadioShack (Tandy) carries Grundig radios, as well as Universal Radio and a number of independent electronics/hobby stores throughout the continent. By and large, I have always liked Etón/Grundig radios–I have purchased nearly everyone they’ve produced in the past six years. I also like the corporation, and it’s founder/CEO Esmail Hozour. It’s also quite simple to get in touch with Etón product support–a live human being is only an email or phone call away. Numerous times, I’ve directed readers to Etón support and their problems have been solved. Bookmark this tag for more information on the Etón Field and Satellit. I have a hunch that they won’t be available until after the 2014 Consumer Electronics Show (CES). This entry was posted in New Products, News, Radios, Shortwave Radio and tagged Etón, Etón Field, Etón Satellit, Grundig on January 6, 2014 by Thomas. One day shipping for $4, UPS says it’s out for delivery right now. Odd, because nobody else has them yet, and even Eton’s website says “coming soon”. It will be interesting to open that box and see what they shipped me! Will post an update this evening. I received the new Field radio today and have started my review of it on my YouTube channel (hamrad88). Here is the link to the first in a series of reviews on the Field radio. I bought one from amazon. instruction manual is missing as it was previously returned. I always liked grundig (eton) equipment going back to the sixties. I operate in the dark ages compare to you people. I know how to program. I had two 350’s but one broke .how can I get a manual for it even though I hear it is not very good. forgot to you it is field. The first video about the new eton field radio, I `ve watched. The Grundig Satellite (Model NGWSATB) sure looks like the Grundig G3 successor. I bought one of the first Grundig G3’s in 2009, and seems to work really nice with the manual tuning knob. The new Eton Field Radio is on Amazon for sale now. Also the Mini Compact. I did not see the Traveller III or the Satellit yet. I’d really like to know how The Sattelit compares with Tecsun PL880. I notice they are available for sale from the Eton website. Has anyone used one or found any reviews for them? 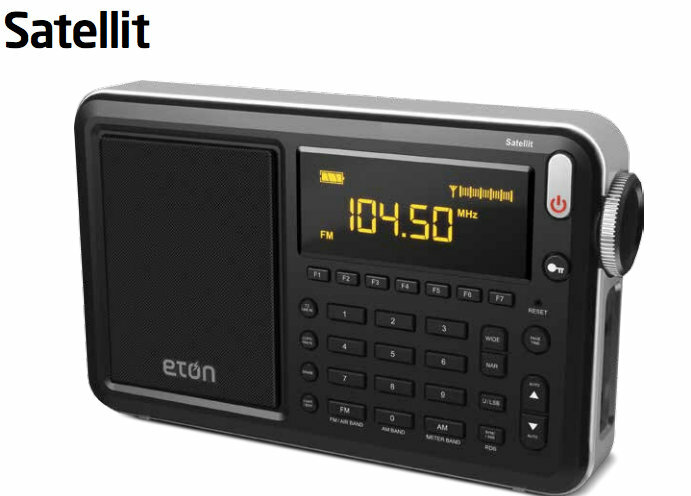 I don’t think the new Eton radios (including the Satellit) ship until April ’14 or so. These radios would be coming out of the Degen factory in China. There will most likely be the Degen version released in the Chinese domestic market after they see how the Eton sells in the west. Avo is correct in mentioning that there is very limited outlets for Eton products here in Australia so unless we import one from Eton, we’ll have to wait until they come out as Degens and are available from the Chinese eBay retailers. Nice looking radio, looks like an updated version of the Degen DE1106, hopefully without the problems that that radio suffered. 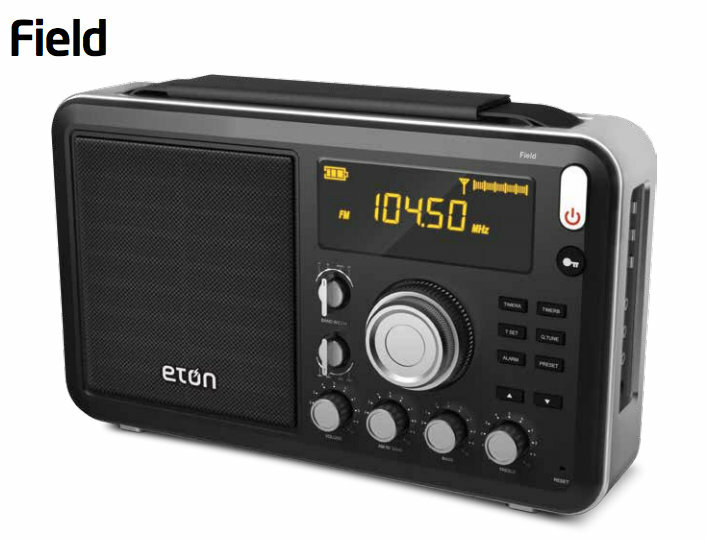 These new Eton radios look pretty slick, but I’m curious on how well they perform (hopefully much better than the Grundig G3/Eton E3). I swore to myself that the Tecsun PL-660 would be my last shortwave receiver (especially with many stations leaving the airwaves), but the new Eton Satellit has me cautiously optimistic. If it performs just as well as the PL-660 or better, then I just might buy this one. Even if all SW stations leave the bands, this radio will serve as a good Wi-Fi radio when I plug my HTC One or Nexus 7 in the audio jack while listening to TuneIn Radio or podcasts. Gorgeous and radio and has already \ ste very important differential RDS. To listen to FM radio is great. What did I get sad is that in Brazil we have not for sale. Hugs to all of the group and invite to visit my Blog: http://qsldobrasil.blogspot.com. If these units are coming out of the same factory in China then the future is a little more exciting due to the badge engineering that will “hopefully” result. Whilst there is no official reseller for Eton products in Australia, there are AVComms with their black import Tecsun range (no PL880 yet but I think it is inevitably coming) and Jaycar with the AR1748 and AR1945. It would be fantastic to have this Satellit turn up as a Digitech. As for the profitability, China seems to be in a grip of SW madness. I would have thought that market alone would make it a fiscally feasible prospect…. Actually shortwave listenership except for Tibet is rather small in China and almost all the major broadcasters have cut back transmissions in Chinese. i’m hoping that they wise-up and release a “Sattelit Pro” maybe, based on the RP-3100 or PL-880. If not that, then maybe a new CC-Radio SW is on the horizon. WD Darnell is correct… Eton is watering down the Satellit name. It should be reserved for the more serious model(s), as Grundig historically did. I think it’s a shift in marketing, however. Those who have been DXers and SWLs for decades recognize the Satellit name for its heritage, but to a younger general public it’s just a cool sounding word. There’s not enough of “us” who will buy a worthy new Satellit model to make it profitable; therefore, a G3 in Satellit clothing is simply no cause for alarm with Eton’s target audience. I agree there is no longer a profit to be made in large portable radios, The E1 nearly bankrupted the company on it’s own. I do think though they could enhance the Satellit 750 with some more filters like the New Tecsun 880 just did, call it a Satellit 850 or something like that. My problem is the G3 was been a disaster for Eton as so many have had to go back (I had to send 2 back myself, I never got one that worked right). Now if they use the same formula as the G5 (identical in looks to the G3) did and just changed to separate USB/LSB, they would have a winner of a radio. And one other radio that they sold well on was the G6. They could bring that back with the black/orange screen and I bet they would sell plenty of those. they are privately held and would not publicly release that kind of info. I’m sorry but calling that one radio a Satelitt is a disgrace to the lineage of the radio. And $100 more then the G3????? The 450 clone looks like it could be a good radio although is RDS and an Orange on black display worth $50 more???? Fascinating array of portables, but why does Eton always seem to leave something more or less essential out? The Satellit should have an alphanumeric labeling capability, shouldn’t it? Otherwise, how to deal with and organize 700 memories? The E1 didn’t include RDS. Hate to quibble, but these seem to be rather inexpensive, but attractive–if not essential utilities. Having said that, these are attractive packages and all but the Mini have RDS. The Satellit also has a selectable sideband sync feature. Will be interesting to see how it measures up against receivers in the same price range, like the Sangean 909X. It looks like they are just freshening up existing designs. The new Satellit looks like it’s a G3, and the Field is just a redesigned RP-2100 based radio again. I would have liked to see something based on the new RP-3100, or Tecsun PL-880. Nice looking radios at least. I suppose there’s a typo in the SW coverage ; it says 17.11 – 30. Thanks Pat! I’ve corrected this now.